The Seahawks’ offensive line is already shuffling. The preseason opener in Kansas City will have Bradley Sowell starting at left tackle, and Garry Gilliam moving to the right side because J’Marcus Webb is out. Newcomer Bradley Sowell will start at left tackle when the Seahawks open the preseason at 1:30 p.m. Saturday in Kansas City (KCPQ Fox, Ch. 13), and Garry Gilliam will move back to right tackle, where he started a year ago. J’Marcus Webb, a free agent signee penciled in at right tackle, won’t make the trip because of a twisted knee. “Garry’s doing fine,” coach Pete Carroll said after practice Friday. “He had to jump back. We were a little slow bringing him on (because of a cyst removal in a knee) just to make sure he was right. Carroll was uncertain about Webb’s return for the next game Thursday at the Clink against Minnesota. Progress with the O-line is the single biggest priority of the preseason. Justin Britt will make his first start at center, Mark Glowinski will make his second start at left guard and rookie No. 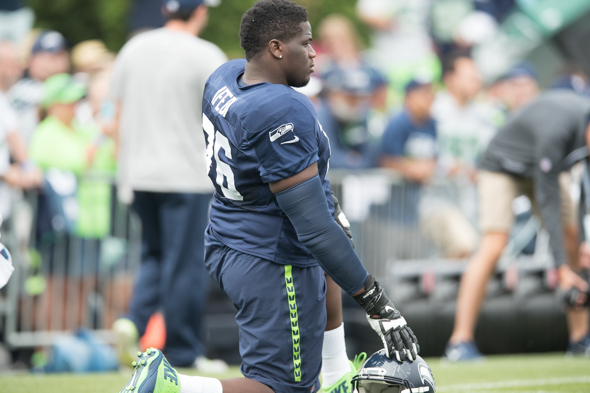 1 draft choice Germain Ifedi will debut at right guard. Sowell was a starter at left tackle for Arizona in 2013 before becoming a backup with the Cardinals the past two seasons. “We brought him here because we saw a skill-set that was pretty cool,” assistant coach Tom Cable said of Sowell. “You have some experience that he’s bringing to the group, which is really important right now. Backing up the guard spots is Jahri Evans, the six-time Pro Bowler in New Orleans who was signed as a free agent last week. He too will get his first action as a Seahawk. “He’s doing pretty well,” Carroll said. “He’s he’s a great learner. He’s a great football player. He’s picked this stuff up and he can play a lot. We’re anxious to see how he does. He’s lost a few pounds with us. Another position of scrutiny is backup quarterback. After Russell Wilson gets a series or two, the expectation is that rookie Travone Boykin will take over and go well into the second half, after which Jake Heaps, the former Skyline High School star, will finish up. “Today was the best day I think he’s had in camp, in regards to communicating,” Carroll said of Boykin, Texas Christian University’s career passing leader. “Like every young quarterback, when you come into this league, there’s so much you have to manage. Right now he’s out there playing football, throwing it around. Then there’s another whole aspect that you have to go through in terms of protecting and getting your team in the right place at the right play. At running back, lots of youngsters will see action. Besides veteran Christine Michael, rookie Alex Collins will likely get the majority of carries, and undrafted free agents Troymaine Pope, George Farmer and Cameron Marshall will play. Carroll listed numerous players not making the trip besides Webb: RBs Thomas Rawls (ankle), C.J. Prosise and Zac Brooks (both have sore hamstrings), WRs Kasen Williams, Kevin Smith and Deshon Foxx, TE Jimmy Graham, DTs Jordan Hill and Sealver Siliga, SS Kam Chancellor. Kansas City’s forecasted high is 89 degrees with humidity at 59 percent.